For humankind it is totally meaningless whether the South Face of Dhaulagiri has been climbed or not. It is also immaterial whether a person has ever stood on the summit of Everest. What counts are merely the experiences one gains along the way. 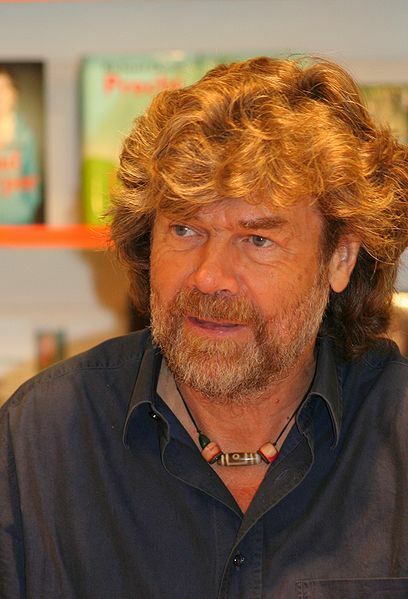 Reinhold Messner - one of the all-time great mountaineersWith this in mind surely in the absence of challenge, commitment and a certain element of danger with chance of failure, the destination, regardless of it's fame, means nothing. Many occupations have purpose and meaning interwoven into their very fabric: doctors, nurses, soldiers, charity workers, research scientists, teachers. Some do not and these account for the vast majority of careers and lifestyles in the modern world. Artists, bankers and sportspeople are not on the face of it required for our society to exist. In that very statement is the word which solves the problem - 'exist'. Increased expectation and the human condition itself necessitates a desire to do more than just 'exist'. We want to develop, learn, earn and experience as much as we can and this yearning is so fundamentally human. It is this fact which makes those artists, bankers and sportspeople so irreplaceable. A world without creativity and 'pointlessness' would be a poor world indeed. This links perfectly with Messner's characteristically elegant statement. An ascent of a south face does not further enable the civilised world to exist but the journey endured and lessons learned along the way enables it to become more civilised. Mountain summits are, in most cases, very easy locations and symbolic achievements to define. There are also a very large number of them. Despite this, the 'style' in which they are attained attracts much attention; himalayan, alpine etc. More relevant to my own specialisation, polar travel, this is not so clean-cut. There are only two geographic Poles although there are a larger number of routes via which to reach them. There are also many different styles; unsupported, resupplied, wind-supported, dog supported etc. However, the North Pole is arbitary except from a scientist's point of view - the floating sea-ice to the left and right is no different. The same goes for the South Pole, despite the American monstrosity of a base built right on top of it. The icecap a few miles to the side in either direction looks suspiciously similar. Given this, the fact that a journey to reach a Pole is only symbolic of achievement is surely undeniable. A journey from the coast to a location five miles to the side of the Pole would be equally impressive. What follows is my confusion as to why artifically shortened expeditions to Poles exist - they provide the empty destination without the journeys which represent the real value. You can go through life committing neither to opinions nor beliefs; appeasing whatever you're faced with, but you cannot take the fence you sit on to the grave. Commit, risk being challenged but never entrench your views. Greenland speed crossing 'Take Two'.